The rumors were true: Samsung is launching a new Gear VR headset and just like Google’s Daydream View it’ll have its very own controller. 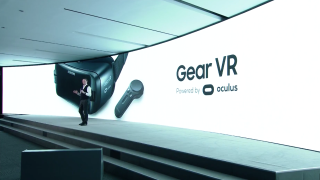 Designed for convenient control when using the Gear VR headset, the dedicated controller is replacing the fiddly trackpad that’s integrated into the side Samsung’s headset in its current form. Though the Gear VR can also support console controllers such as the Xbox One controller via Bluetooth, this dedicated controller is intended to be used one-handed for greater convenience as well as improved motion interaction. By combining gamepad and remote functions into one device, the controller will streamline the experience of using the Samsung Gear headset and make it easier to use all of its functions with greater ease. The controller has a touchpad and finger-trigger built-in for gaming. The finger-trigger is intended to make in-game activation easier while the touchpad in intended to provide quicker selection and interaction over a host of VR apps. It’ll also enable more forms of motion including the ability to point, drag and drop, tilt, and shoot. Home, volume and back buttons will also make it easier to control the headset itself as well as interact with the content being used. Don’t worry if you’re an enthusiastic player – there’s a wrist strap attached to keep you launching a controller projectile at innocent bystanders and objects. As far as battery is concerned, according to Samsung we can expect to get around 34 days out of a full charge based on an average use of around 2 hours per day. The near headset will offer 101 Field of View as well as advanced distortion correction technology that should minimise any experiences of motion sickness. Both the headset and its controller will support micro USB and USB Type-C ports with a converter inbox. In terms of color, they’ll have an Orchid Grey finish and the headset will have a strap built-on to hold the controller when you’re not using it. A final release date and price haven’t been revealed just yet but the latest headset will be compatible with the Galaxy Note 5, Galaxy S6 edge+, S6 and S6 edge and Galaxy S7 and S7 edge.